Wyllie's Panorama of Portsmouth & Southsea. Click on the movie film to watch a panning movie of the panorama. In 1932 (a year after Wyllie's death) Portsmouth City Council's Beach and Publicity Department included a copy of Wyllie's Panorama of Portsmouth and Southsea with their City guide book. The prints were also for sale on the counter of the Beach and Publicity Department, now demolished, which was between the rock gardens and Southsea Castle. The prints were 2/- (10p) each. In 2011 a Portsmouth gallery had a faded copy for sale with a price tag of £235.00. The original watercolour is in the collection of Portsmouth City Museums. Although he never flew in an aeroplane Wyllie made many aerial and panoramic views including First World War battlefields at Ypres and the Somme, London and the River Thames and other views of Portsmouth and Southsea. 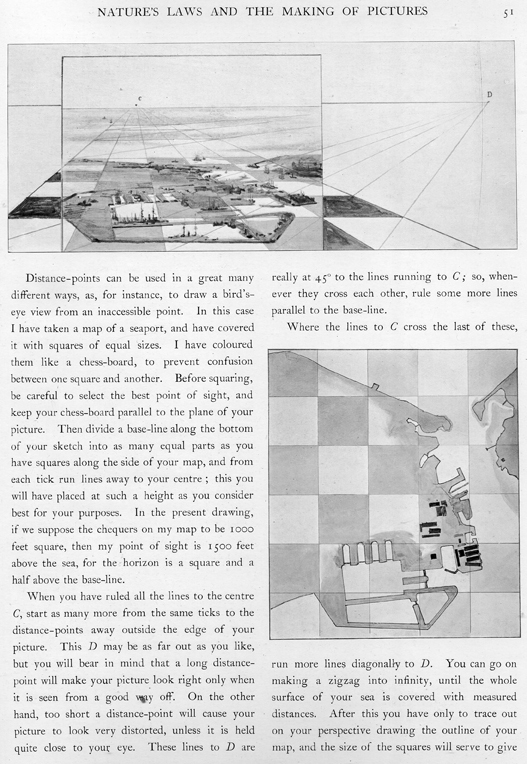 He achieved accuracy in his views by using perspective and mathematics, he showed how he did it in his book, 'Nature's Laws and the Making of Pictures' published in 1903. The 'map of a seaport' that Wyllie uses to demonstrate his technique is Portsmouth, Hampshire.